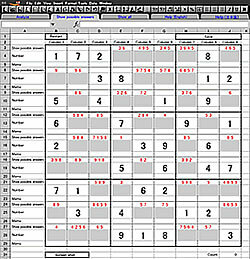 Can’t get enough of Sudoku but it’s a no-no at the office? Go covert and play anytime! Now you can even play at work, and nobody will know. This game-created especially for iPad-works the same way as Sudoku or Number Place: the user solves the puzzle by putting in numbers one through nine. Only there’s one huge difference: it doesn’t look like a game at all. Instead it looks just like spreadsheet software, complete with fake buttons. So even though you’re doing a puzzle, everybody will think you’re hard at work! And Covert Sudoku is a great way to train your brain into tip-top shape. Here’s more about how the game works. If you get stuck, you can have the program display a hint: some possible answers fill each empty box, and one will be the right one! And if you just don’t have time to finish that puzzle, you can go ahead and save it for later-and keep on going back to it any time you like. Whenever you solve a puzzle, press the Save button to save a screen shot to your Pictures file. So go ahead, solve lots of puzzles, and save them to impress your friends later! Of course, there will be times when you just want to give up. In that case press “Show All” to see the entire set of correct answers. For info on the rules, refer to the Help guide. Buy Now!